The compact plants of Curled Scotch yield tender, blue-green, crinkled leaves that are delicious, very cold hardy and rich in vitamin A. 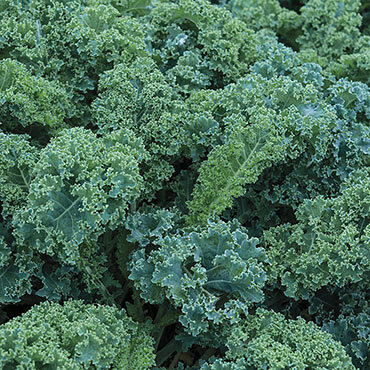 It's slow to bolt (meaning it won't prematurely create flowering stems, thus diverting nutrients away from the kale) and does not yellow from heat or frost. In fact, light frost actually improves its tenderness. Harvest as baby leaf kale in just 25-30 days. Whenever you harvest it, kale is filled with cancer-fighting antioxidants, as well as excellent amounts of calcium and dietary fiber. Add fresh to salads, or roast for a surprising, deliciously crisp texture. 50-60 days to maturity. Height: 12 - 14 inches. Spacing: 12 inches apart in rows 18-30 inches apart. Foliage: Finely crinkled, blue-green leaves. Depth: 1/4 to 1/2 inch. Germination: 4-7 days at 45-85 degree F.
Days to Maturity: Baby leaf in 25-30 days; mature leaves in 50-60 days. Soil Preference: Rich, well-drained soil.